XPRESA supplies Clothing Labels, Woven Labels, Printed Labels for the textile and apparel industry.We offer quality CLOTHING LABELS, WOVEN LABELS AND PRINTED LABELS for a great price and PROFESSIONAL Service. We supply clothing labels, woven labels, custom woven labels, printed clothing tags, apparel hang tag labels, apparel woven labels, and many more. Printed satin acetate is the most common for use on clothing where cost or ultimate softness is a major concern. We can produce up to 3 colors on a satin acetate. This form of label does not last as a woven label because woven labels are produced using thread colors to recreate your artwork, whereas printed labels use ink. Ink will fade after regular washes. Xpresa Woven Labels are high quality and are durable under all environmental conditions and wash cycles. Broadloom – A satin based woven label produced on a highspeed wide loom. The look is more soft and less sheen then regular single needle satin loom. Care Label – Woven or Printed label with fabric content and care information. Individual or on reverse of centerfolded labels. 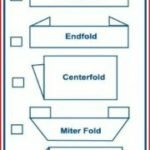 Centerfold – Woven or Printed label folded from the center, horizontally or vertically. Stitching performed on loose ends opposite of folded portion. * 0.8”(2cm) Minimum for woven labels. Cut/End Fold – Woven labels folded on the left and right side of label. Usual seam allowance starts from 1/8”(0.3cm). Stitching is performed on the inside of the inward fold. Denier – A unit of fineness for thread yarns equal to the fineness of a yarn weighing one gram for each 9,000 meters(100-denier yarn is finer than 150-denier yarn). Die Cut – Custom cuts for finished woven labels, typically for round shapes. Cuts are from precise blades based on custom requirements. Digi Color Weave – Also known as a photo weave. Small diameter(50-denier) threads are used to bring out photo-like qualities, much like pixels used in computer imaging. Fuse Cut – A heated and pressure based process used to cut into polyester based threads, where the threads curl back because of the applied heat, thereby preventing the threads to fray. Hang Tag – Printed labels usually available in a variety of card stocks with a matte, semi-gloss or glossy finish. Typically used on the outside of garments, attached with a string with clip/pin. The label has logo, sometimes written text, and an area for pricing or barcoding. Typical card stock is from 12pt. to 18pt. High Definition – High end process using high thread counts to achieve the ultimate clarity and a smooth finish. Iron On/Heat Seal – Woven or Printed labels go through an additional process of applying a heat seal coating, which enables the labels to be applied to garments using a heat sealer or iron. Additional stitching creates a more permanent bond. Laser Cut – A precision cutting operation for woven labels. This process requires and additional fee for custom cut applications for woven labels. Loom – A weave in which warp threads interlace with filling threads to produce a smooth fabric. All woven labels are produced by a loom. 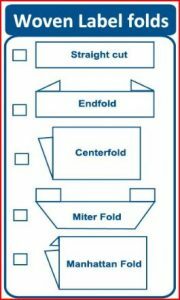 Mitre Fold – Also called a Manhattan fold, were the rectangular ends are beveled to be stitched on top of ends. Needle Loom – Very clean and soft shiney process that is used mainly for intimate or bridal wear. Printed Label – Labels printed on satin acetate, card stock or other printed paper based material. Flexo or Rotary stamping. Pressure Sensitive/Adhesive – Woven or Printed labels with an adhesive backing. Most typical for stand-alone material or surfaces that do not go through wash cycles. For example, back of carpets, upholstery, tiles, boxes, shoes or furniture. Not recommended for clothing. Reverse Satin – A reverse weave of satin thread used to create dimensional look combining sheen and matte finish. This reverse process is for woven satin labels. Satin Acetate(printed) – mooth soft high quality ribbon made of acetate. Blank satin ribbons are printed(silk screen) and cut/folded according to requirement. Printed satin is excellent for logo/type-set clarity and soft feel. Great for lingerie or other sensitive applications. Self-Adhesive Labels – Woven or Printed labels with an adhesive backing. Most typical for stand-alone material or surfaces that do not go through wash cycles. For example, back of carpets, upholstery, tiles, boxes, shoes or furniture. Not recommended for clothing. Size Labels – A label that indicates sizes which can be stock(ie, S, M, L etc.) or custom based on use of end-product. Straight Cut – A label that is cut and finished on all sides. End user usually sews in from all four sides. Mainly used for patches or outer woven labels for accessories. Taffeta Printed – Not really made of taffeta but called because of the matte(not shiney) appearance of the rolls. Very basic and paper-like quality. TPC/TPX Codes – A color code system developed by Pantone. Most textile manufacturers use this code system to provide close color matches to designs. TPC/TPX are not the same as PMS(print Pantone codes). Ultrasonic Cut – A delicate cut use for woven labels, where the labels are cut using vibrations, rather then heated cutting(fuse-hot knife). The end result is a label with smooth and soft cut edges. Can be used for one side only and not on all sides of the label. Upground Weave – A textured looking label used mainly to provide a thick and rugged appearance. Great for patches, uniforms used on the outside of items. Weave – The process of creating a woven label with threads that are projected through a loom. Woven Edge – Labels which have a smooth finished edge, as opposed to a fuse cut edge. Woven Label – Labels produced using looms. Xpresa offers top quality woven label products for clothing label, accessory labels, manufacture labels and all other custom woven label applications.